The Grand Coalition on a people-driven constitution is a bunch of individuals who are in the habit of making noise simply because they want funding from their donors, Chief Government spokesperson Chishimba Kambwili has charged. But coalition spokesperson McDonald Chipenzi has advised Mr. Kambwili to be level-headed when discussing issues of national interests rather than making statements to demean Non-Governmental Organisations (NGOs) over their funding when Government also depended on donors. 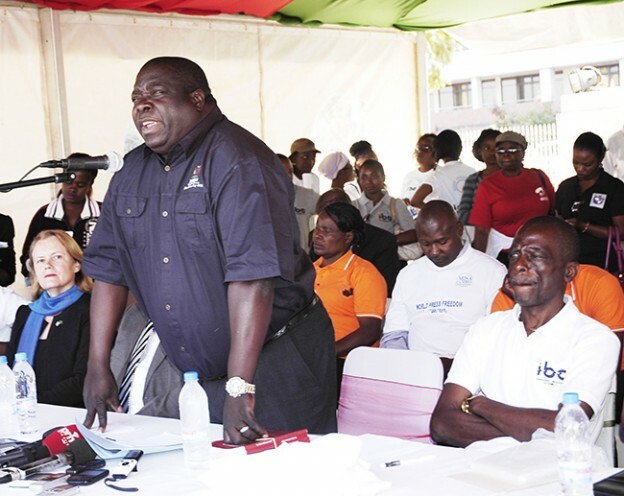 Reacting to the coalition’s 90-day ultimatum to Government to start the process of enacting the draft Constitution through a referendum, Mr. Kambwili said the group was just dreaming because the State would never change its position as long as the coalition did not provide money for the exercise. He said the country did not have money to undertake such an expensive exercise and that it was irresponsible for the Grand Coalition to demand for what was not possible when Government had already provided a roadmap on the enactment of a new constitution. “They were quiet for some time but they have resurrected because their pockets are empty, they are broke and now they want to show their donors that they are working by reviving their demands but it will not work out. “Tell Father Leonard Chiti and friends that they can continue dreaming because it is allowed to dream. We shall not prevent anyone from dreaming but whatever they are pushing for will never be achieved because we are not a reckless Government that will call for a referendum to please a few individuals,” Mr. Kambwili said. But Mr. Chipenzi advised Mr. Kambwili to be sober because the coalition was speaking on behalf of Zambians in accordance with the constitution. “We are speaking in accordance with the provisions of the constitution and according to the citizens’ call. So, Mr. Kambwili should not accuse us of dancing to donors because even Government has donors to which it is dancing to right now by flouting the provisions in our constitution. We have not changed and we will never change our position on this issue and we will not back down from this call,” Mr. Chipenzi said. During a press briefing on Sunday, the coalition gave Government a 90-day ultimatum to start the process of enacting a people driven constitution through a referendum as opposed to a piecemeal amendment of the non-contentious clauses while subjecting the rest of the document to a referendum to run concurrently with the general election. Going by what we have seen of Lungu so far forget even piece meal amendments.For example if he allowed the50%+1 clause it would definetly be suicidal as he would be lucky to even win by simple majority as things stand right now. Donor money is good for country Ba Kambwili. I don’t understand why Kambwili is so finished that he is just puffing everyday. Wow, is that a gorilla! Oh, its just Kashimba Chimbwili defending his turf – typical of the PF stance on everything, even progressive talk from citizens! Seriously he looks like a gorilla! Meanwhile he makes noise to keep his government job. With these silly comments about Kambwili’s looks, that is why at one point he referred you to your own Nalumango — just criticize what he has said and save us your pettiness. What is “silly”in commenting about looks of ancestor of homo sapiens? KAMBWILI, THEY ARE IMITATING YOU OR SHOULD I SAY APING YOU. YOU MAKE NOISE TO EARN YOUR SALARY AND TO KEEP ACC FROM YOU BUT WAIT YOUR DAYS ARE NUMBERED? LETS SEE HOW YOU WILL YAP IN COURT. You are right. They are not sharing donors money with the people. But on the other hand, they are also not stealing money from euro-bonds. Have guess which group has become RICH at the expense of people? The one which speaks for themselves or the one which is emptying strong room in Bank of Zambia. By the way, do you understand meaning of “acute 1mbecility”? No? Shame. But do not worry. Just look in the mirror and you will look at the exponent of that fine group of intelligent people affected by the “acute 1mbecility”. Me I say YALI must take full blame for putting us in this mess. It seems government listened more to those guys than our friends. Now we all look foolish because of YALI. But one day YALI will look back and cry at the animal they created on this process. Whatever YALI says, it seems government listens to them more than anyone else. Why? Surely this organisation must be brought down.